Do you really need to pay an accountant to do your taxes? You may not even need to pay a service. 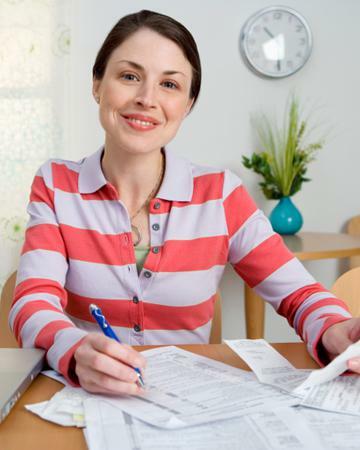 These free ways to file your taxes will save you a little dough, even if you still owe the IRS. It’s that dreaded time of year again. No, I don’t mean the three months you have between the realization about what all that winter comfort food did to your waistline and bikini season. The tax-return deadline is right around the corner. If you go to an accountant, even a simple return will cost you around $200 for your federal and state. * If you’re a freelancer or have complex tax issues, hiring a professional is probably the best course of action; he or she will save you tons of cash in the long run. But if you know that you have no real deductions, you might consider DIY tax preparation with one of these six tools. Note that most free tools ask you to pay for your state tax preparation. The simple reason why is that not all people are required to file state taxes (for example, in Texas, no one pays state taxes, though there are other taxes that are paid throughout the year). You should also know that the free tools all have the same basic thresholds for free filing… the same ones that are on the IRS’s free filing option. In general, you qualify to file free if you’re an individual or family who had a combined income of $58,000 or less in 2014. It’s the other bells and whistles, which the IRS’s option doesn’t have, that may be different from company to company. Some companies may even have free filing options for those who make more. Believe it or not, the IRS actually sponsors free tax help for low- to moderate-income families. If you qualify, volunteer tax counselors can help you file your own taxes and provide free basic income tax help. They won’t be able to help you with state taxes, but they can offer you e-filing options, which help you get your refund (if you have one coming) faster. There’s also a tax counseling for the elderly option for those 60 years of age or older that specializes in answering questions specific to seniors. MyFreeTaxes.com has handy checklists to help you gather everything up front, and it saves your work in case you do need a break. The software has error checkers and calculators to help you reduce the chances of making an error. This one does allow you to file your state taxes (even multiple state tax returns) for free so long as your adjusted gross household income is less than $60,000 for the tax year in question. TaxACT will let you e-file simple and complex tax returns for free, regardless of your age or income level. It guarantees 100 percent accuracy and even gives free tax help and audit support. Filing your state taxes does cost $20 per state. It also has inexpensive deluxe options that include extra calculators and reports, bonus support options and the maximization of certain types of deductions. Multiple refund options include the typical direct deposit option, but you can also purchase U.S. Savings Bonds in $50 increments or get your refund via a prepaid Visa debit card. Probably the most recognizable online tax filing service, TurboTax will more than likely be more expensive for those who need to do state taxes. It’s almost double that of TaxACT, but it does have a really simple question-and-answer interface and live chat tax advice. There are additional packages available for those who need them, which range up to $100 for federal returns. These more advanced deduction and donation calculators are for those with more complicated tax returns. HRB doesn’t just offer in-person preparation. You can use its free e-filing tool and get automated help and credit checks. You only get one session of live help via chat or e-mail, though. You’ll pay about $30 for your state preparation. This option is about the same in terms of price for state returns as TaxACT ($23). The eSmart Tax free option only supports the Form 1040EZ, but upgrades are fairly inexpensive ($25 for a 1040 and Schedule B plus the ability to itemize deductions). *According to a National Society of Accountants study based on 2013 fee schedules. Prices vary by location; private vs. franchised practices; and whether you need an EZ return, 1040 with a Schedule A and state tax preparation.